CUSTOMIZE using the yellow Customize Now button on the right. FRAME SIZE: 6.25-inch height x 8.25-inch width Fits pictures that are 5 x 7-inch. SIGN SIZE: 5 x 7-inch. PROPERTIES: Matte finish art print, digitally printed on high quality paper, with vibrant colors. Actual product color may vary slightly due to differences in monitor settings. 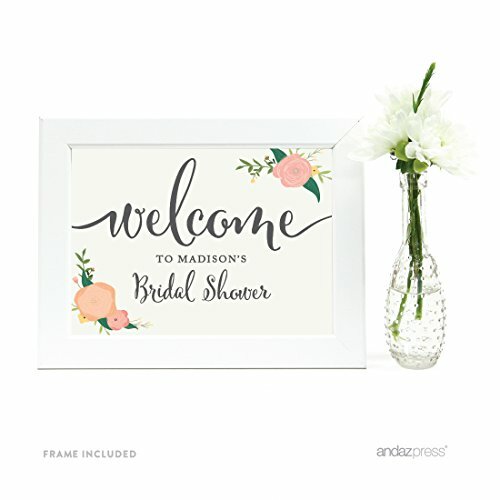 PERFECT to guide guests, and add a unique touch to your special event. REUSE the stylish frame to hold 5x7-inch photos or art prints! Can be used hanging or standing, both horizontally and vertically.